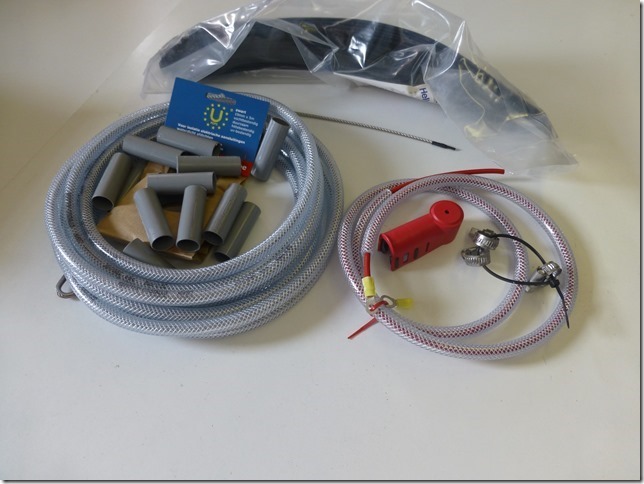 The KISS-SSB is perfect for all fiberglass, wooden or even metal hull boats, both sailing vessels and motor vessels. 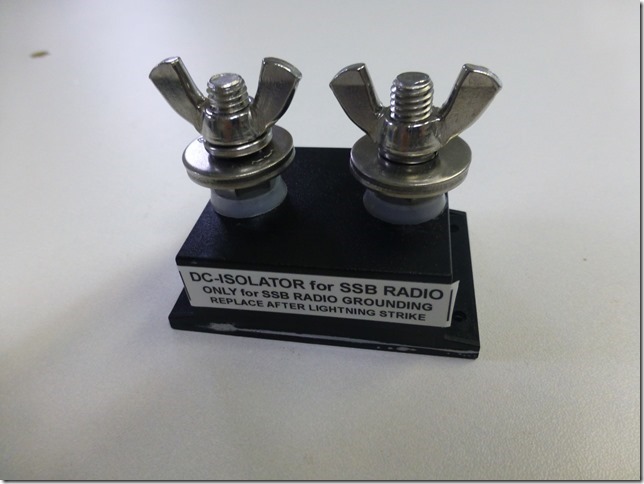 This simple grounding / counterpoise array is specifically designed for transmitting on all the common SSB channels and HF frequencies along with the long range ham frequencies, Sailmail, Winlink, and NOAA weather, when used with a tuner. All of these frequencies test to less than a 1.5 to 1 Standing Wave Reflection (SWR) with low power loss! 1 - No need to drill holes in the hull under the waterline for a "grounding plate"
2 - No need to run the copper foil everywhere. 3 - No need to bond all the thru-hulls. 4 - No maintenance keeping the underwater bronze grounding plate clean. 5 - No drag when sailing. 6 - Can even be used when your boat is on the hard and not in the water. Installation location is not dependent upon where the water line is. The KISS-SSB is it's own reflective counterpoise, that means you can install it anywhere within four feet of your tuner location. 7 - No need to constantly check all the copper foil connections for corrosion breaks. It has been proven that HF frequencies do not penetrate more than two inches of saltwater, that is why submarines use very, very low frequencies at 15khz. SSB / HF frequencies are in the 3 to 30 mhz range. There you have it, the bronze ground plate is only effective if it is on the upper few inches of the water. This is not practical at all on the hull of a healing sailboat or motor boat. That is why metal hull boats always have such a great signal, they have a lot of surface water skin area. It is the use of a copper radial system much like the principal that the KISS-SSB uses that works. We are seeing many metal hull boat owners use our KISS-SSB instead of their hull due to corrosion concerns. The main advantage of the KISS-SSB over using 100 square feet of copper foil is the fact that the KISS-SSB uses perfectly measured copper radial lengths to match the frequencies used for marine SSB, which means a better and stronger signal, a lot less RF interference, and it's simple to install and makes for a clean fast installation. The proper name for a ground plane is "Counterpoise" if you study that name you will see that it is an opposite phase signal below the antenna to repel the high wattage signal off of the radiating antenna such as the backstay / whip / GAM. Thus the name "Counter" poise equals "opposite phase signal at a low wattage strength. This counterpoise signal needs to be below the radiating antenna and thus is simply closer to the ground or water, and this is why it is also called a "ground plane". The problem here is that so many people think of it as an "earth ground" when in fact it has nothing to do with earth ground, but simply is a low wattage opposite wave phase signal below the high wattage antenna of choice. It is a proven law of physics that a radial cut to proper wave length will resonate with that particular frequency. 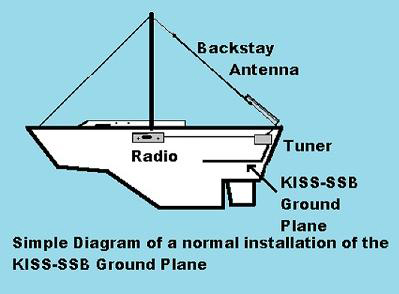 The KISS-SSB uses many radials to resonate in all the marine SSB, Winlink, Sailmail, NOAA Weatherfax and all long range ham frequncies from 2mhz through 28mhz. All in one easy to install neat package, the KISS-SSB makes for the perfect counterpoise/ground plane on fiberglass or wood boats. Even metal boat owners use our KISS-SSB instead of their hull for corrosion concerns. The KISS-SSB is a self-contained counterpoise radial counterpoise system that is the perfect answer for trouble free Marine SSB communications. The word "GROUND" could be the problem it should be "COUNTERPOISE" The system of using exact pre-measured counterpoise ground radials is even suggested in every Icom, SGC Smart Tuner, and Furuno Auto-Tuner manuals. Right now the most commonly used tuner is the Icom-AT-141 and if you look on page two you'll see the principals used in our KISS-SSB Ground Plane System. Using the lifelines, engine, tanks and other metal is the most common cause of RF interference and static, and it can upset other electronics. High-quality ground strap with 10 or 25 mm 2 cross section. Tin coated aluminum mesh with 0.2mm wires. Easy to solder and connect due to the tine coating. Suitable for grounding a transceiver or an amplifier to the station ground, to bridge the joint on the trunk lid on a car, to connect antenna wires or radial systems in outdoor areas. Available per meter. 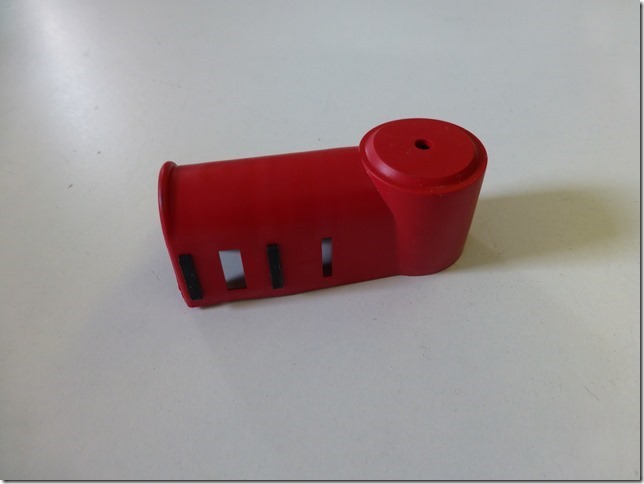 USB isolators need to provide protection against harmful noise, ground loops, surges, and spikes. From compact USB port isolators for field service applications to EMC tested rugged isolators for unfriendly electrical environments, our products will keep your computer and data secure and safe. 5 meter verbindingsset tussen de antenne en dekdoorvoeren naar de antenne tuner kompleet met stagklemmen, afstand houders, beschermkap en beschermbuis.